When we set out on this adventure a few years ago, we thought we would have hit Grenada last summer, and passed through the Panama Canal right about now – preparing to decide if we wanted to bash or head towards Hawaii (google the Baja Bash…we own a book subitled “the essential survival guide for boats, spirits, and marriages returning up Baja”). I love it! We have learned one important thing with full time cruising…plans are written in soap bubbles easily washed away. Some bubbles washed away as we got smarter and better understood our limitations (stamina, lack of speed, teleworking and such). Others were swept away by weather and other unforeseen circumstances (illnesses, breakdowns, a need for that important part). We also purposefully hosed down other bubble plans as we found better/different places to sail by talking to people we met, stuff we read up on, and kid boats we found (much rarer that we had hoped…sad to say). Even so, I wouldn’t change how we’ve managed this adventure so far – it’s been a great experience for us all – and given us many wonderful life lessons. 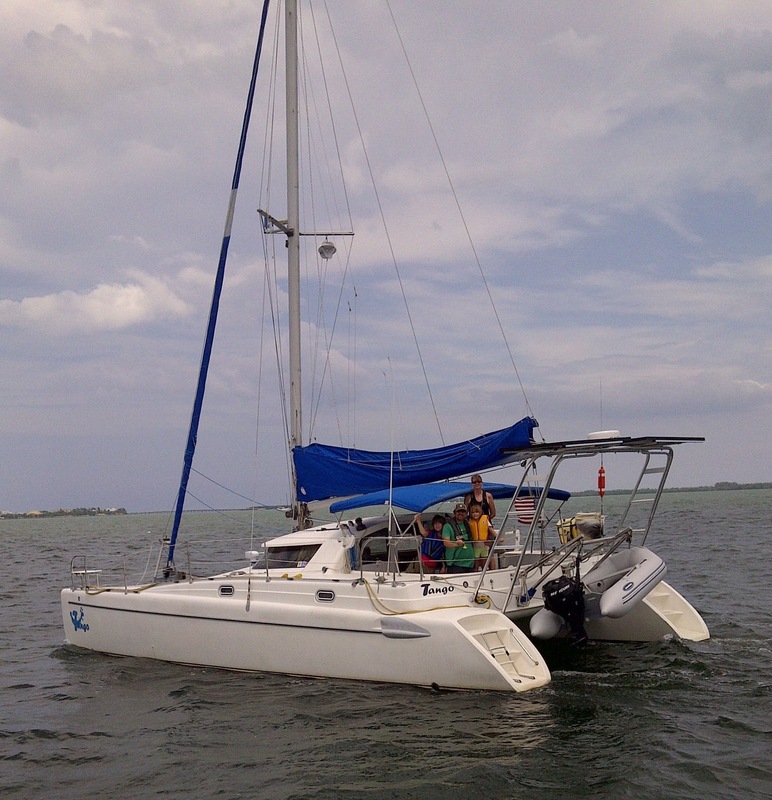 Cruising and adjusting to life has made this family more patient, appreciative, and adaptive. All along we had planned to use Tango as a way to get back to the Pacific NW, back to our home roots and family. We have accepted that sailing there together won’t work (and splitting up to manage work and taking on crew to get the boat there sort of defeats the point of all this…something under consideration for a long time), so we are going to let an ocean shipping company ship Tango for us. In a few weeks (May 12th is the current date when the AAL Dalian arrives in West Palm Beach) Tango will get crane lifted onto the Dalian, strapped down in a custom cradle, and shipped by Sevenstar Yacht Transport up to Victoria, British Columbia. Tango’s trip should take about a month, depending on loading/offloading in the three other ports of call and as always, depending on weather. Here is a video Sevenstar sent us earlier in the year that shows the process, if you are curious about how it works. We will motor up to the Dalian and say goodbye to our home for a month (gulp!). On the other side, we’ll meet Tango in the Port of Victoria (with many sighs of relief and joy). From that point (mid-June) we’ll have the summer to bop around in the Puget Sound before we make the last big hop off the Pacific coast down to the mouth of the Columbia River (graveyard of the Pacific). The soap bubble plan (see how we worked that in?) is to be settled in our new home marina in Portland, Oregon before cooler weather sets in (and the less favorable sailing conditions that come with it). Yikes…cooler weather…winter…ice and snow? Right now anything under 70 degrees makes us shiver…boy are we in for it! Good thing we’ll have a “summer” to acclimate (yes we are poking fun at everyone in the NW…but after all this Florida/Bahamanian heat and humidity summer in the NW needs quotes around it). Heading up the mast has never been one of our favorites. From time to time, however, it is necessary to take the 55 foot journey up the mast to repair the various things that fail. This time it was an anchor light that needed replacing. 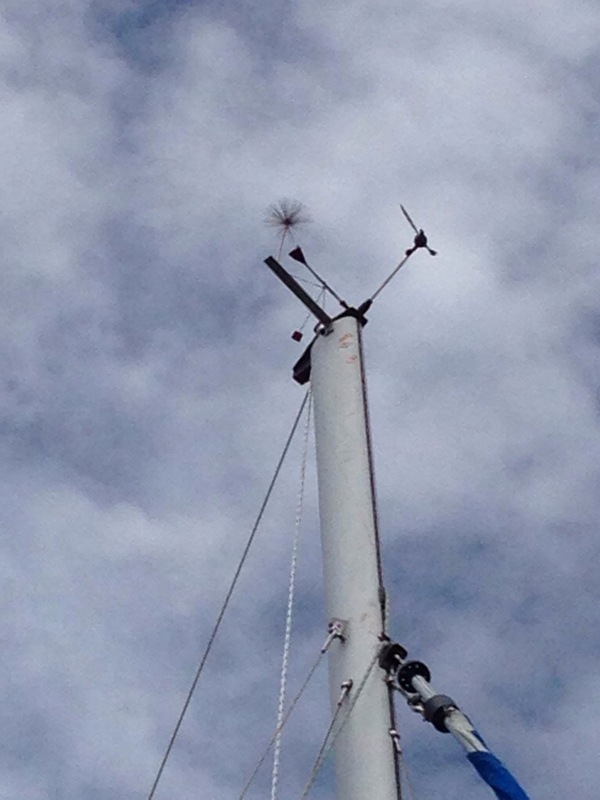 (Naturally it’s at the very tip top of the mast.) About a month ago we decided that we wanted to replace all of the incandescent lights with the much more energy efficient LED alternatives. We had been putting off doing the anchor light because it is just such a pain to get up there. Robin has to winch my heavy body up to the top and I’m not a fan of heights. Regardless, it needed replacing and so a few weeks ago we made our first attempt. This was the result. A couple of weeks later we received our new bulbs in the mail and we tried again to remove the remnants of the old bulb without another blood bath. Success! No blood, no tears, and we now have an even brighter bulb that uses a fraction of the power. Little victories. For me, going up the mast is something that I’m not fond of. I just never trust my own knot tying skills. Today, however, I added another level of “damn it” when I sliced my finger open at the very top. I was trying to replace the masthead light as we want to replace it with an energy efficient LED array. I was in the process of twisting the bulb when the whole bulb collapsed in on itself and I sliced myself pretty good. Poor Robin had to dodge a light rain of blood as she lowered me down. 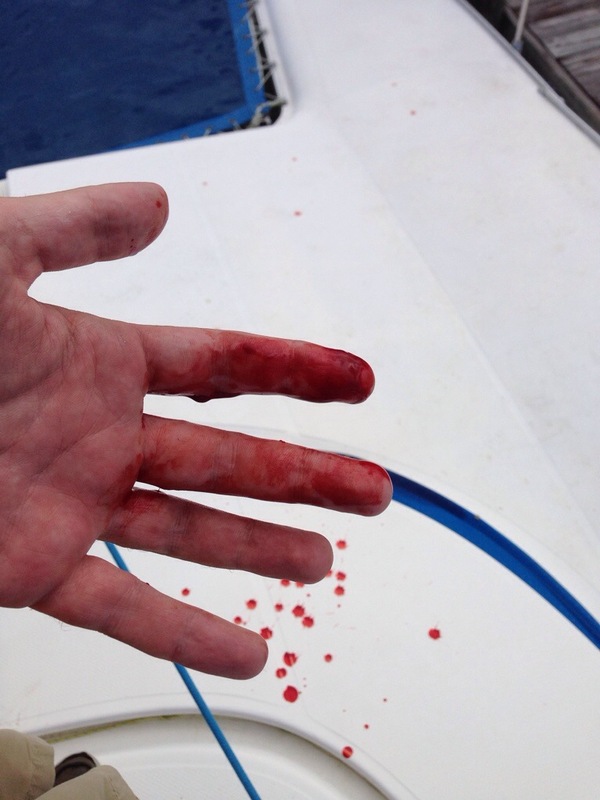 The deck had a pretty crimson painting on it by the time I got down. Jackson Pollock’s got nothing on me! A new spot to relax! Robin found a neat idea for a hanging chair on “Bumfuzzle’s” blog. I think it’s going to be a hit! 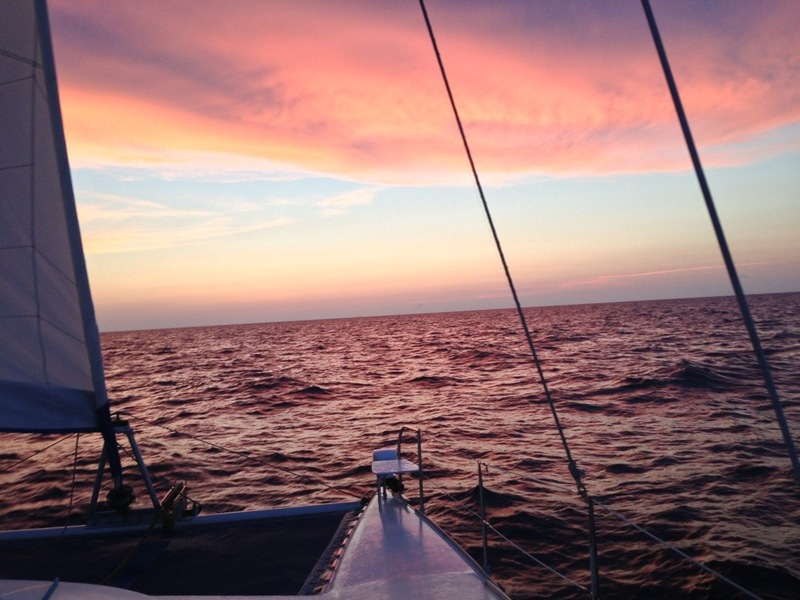 If you want to read a funny and inspiring blog about cruising…Bumfuzzle is a great one. After spending a lovely month and some change in Miami we are faced with the approaching hurricane season which officially starts on June 1st and lasts through October. 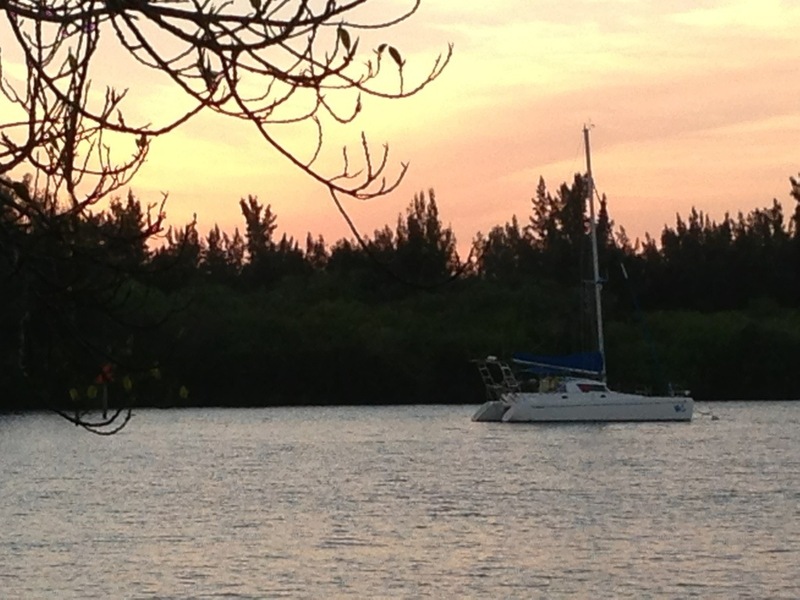 Not feeling like we have really fulfilled our obligation as cruisers to make it to a tropical island yet we decided to make a slight zig-zag course back to our summer “safe port” of Vero Beach, Florida by way of Grand Bahama Island. The Bahamas are, for many East coast cruisers, the very first experience venturing out into the ocean and landing in a literal tropical paradise. Their proximity to the United States makes them an attractive destination as the nearest island to Florida, Bimini, lies less than 60 miles from Miami. The trick to making it to the islands safely and soundly is to navigate the sometimes treacherous Gulf Stream. The Gulf Stream is a strong current that runs northward from the tip of Florida and makes its way all the way to the western coasts of Europe. It flows the strongest between Florida and the Bahamas. 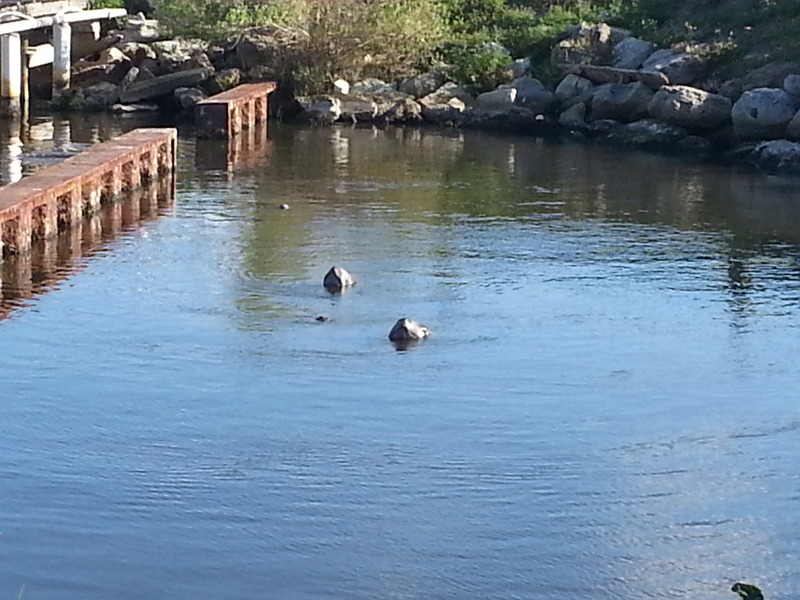 One can use the stream to their advantage by using the current to gain some speed while traveling north. This was what we counted on when we departed in the afternoon on what would be a 17 hour overnight motor sail from Government Cut in Miami to Freeport, Bahamas. The winds were blowing out of the south east which made for a pretty smooth sail. The treacherousness of the stream that I alluded to earlier is that it can go from calm to terrifying and potentially deadly with just a shift in the wind. When the winds are blowing from the east, west, or south, things are generally pretty stable. However when the wind shifts to a blow from the north then it is time to stay clear of the stream. The problem is when wind, moving south, meets up with the current, moving north. The resulting effect is that very large swells can build very quickly. It is not unheard of for people to get stuck out in the middle with near gale force winds and waves of over 30 feet high. Needless to say we aren’t looking for THAT much adventure in our lives. Apart from the nervousness that we all shared because it was out first time out in the ocean with Tango, the trip was very pleasant. 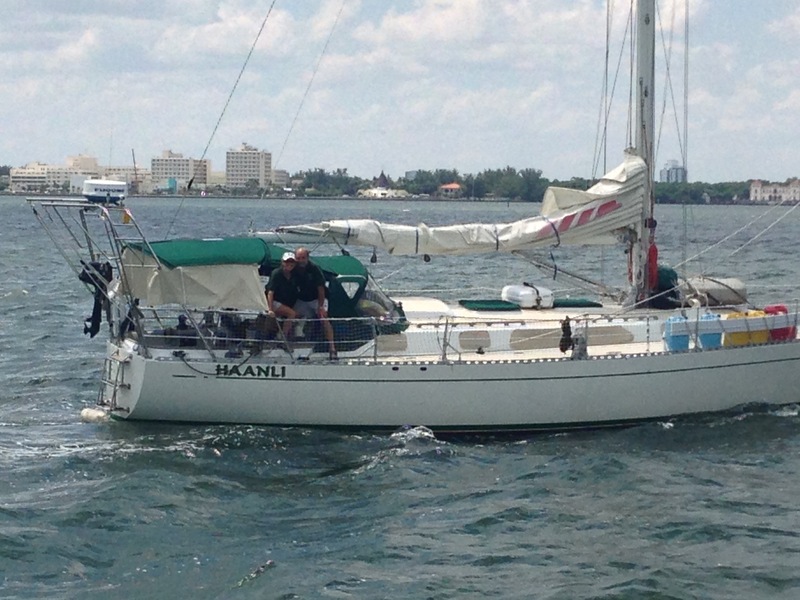 We traveled with our friends Hank and Lisa who were aboard their vessel Haanli. 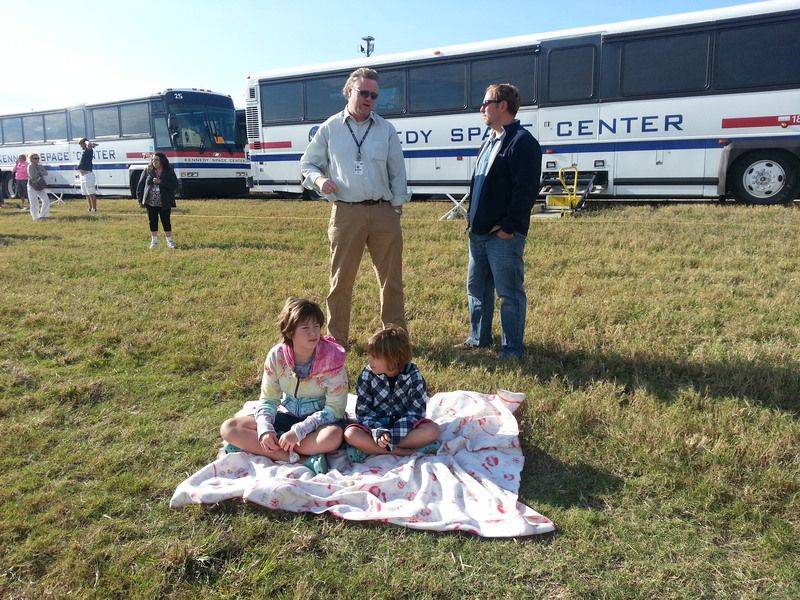 Their presence eased our tension because we knew that we had someone to call on if we ran into trouble. Plus it was fun jabbering back and forth on the radio all night. We were treated to a gorgeous evening on the ocean. Swells were no more than two feet and the wind was light and unthreatening. As soon as the sun set a full moon crept over the horizon in all of it’s orangey glory. The girls enjoyed dinner in the cockpit and made animals out of clay as we made our way north east. This locale was a perfect time to really test out our radar system. It has a range of 24 miles and I could very easily pick out the various freighters, tankers, and cruise ships that were making their rounds. I felt much safer because of it. It’s nice to have an electronic set of eyes as a backup to my own. I was really impressed with how far out into the ocean our cell phones worked. 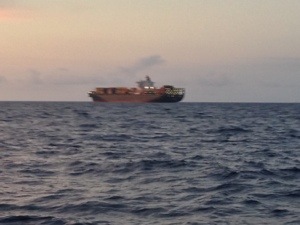 I even made a call to my mom (well…her answering machine) as we were about 15 miles out in the Atlantic. In the middle of the night I noticed that my cell phone had picked up another cellular carrier that I didn’t recognize. Not wanting to incur any ridiculous data charges I quickly put my phone into airplane mode. In retrospect I think that what I picked up was a passing cruise ship’s cellular system. The first thing that struck me was the color of the water. As we left Miami the shallows of Biscayne Bay with its lightly colored aqua marine hue gave way to an almost indigo blue color as we went from depths of 15 feet to near 2000 feet deep in a matter of minutes. I took pictures but they don’t do the color justice. Some things just have to be experienced in person. Around midnight the winds picked up to around 12 to 15 knots which, had they been blowing more south than east would have enabled us to shut off our engines. Such was not the case but the wind still gave a big push anyway. Robin and I took three hour watches overnight. I was never really able to relax during my off time because I am always worried about the engines acting up. I’m getting better at fixing our diesel engine but it is still not my forte. As the sun rose we were still about 15 miles away from Freeport and the crew from Tango and Haanli noticed that we were not making good headway through the water. Very slow going to say the least. We have subsequently decided that what we were experiencing was a back current that runs along the gulf stream on the sides. 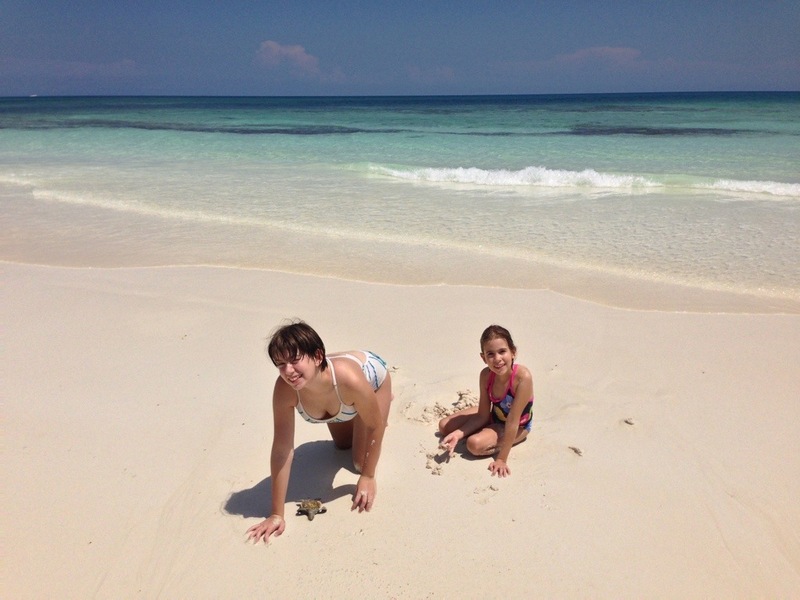 It was annoying as we were all pretty tired but the thought of white sandy beaches kept my spirits up. We arrived at our marina about 9:15 AM. I mention this because Lisa and I made a bet about our arrival time. I said 6:30 AM and she said 9 AM. We need to take her to Vegas with us some day. Clearly I lost the bet and as a result I had to provide them with “Dark and Stormy” cocktails. All is not lost though because I didn’t have any of the ingredients for the drinks but Hank and Lisa had everything I needed. I consider that a win for me! After we checked in through customs and immigration I immediately collapsed in bed for a quick nap after being up for over 28 hours. I was awakened in the afternoon for a walk to the nearby beach. I almost said no because I was still very tired but I figured I could nap on the beach. I’m glad I went because the beach was the prettiest beach I have ever been to. The waters around here, again because of the gulf stream, are absolutely pristine. The sand is white and the consistency of sugar. I’m a fan. After cooling off in the ocean I fell asleep on a towel and woke up with a very impressive sunburn. Yes…I forgot to sunscreen. We plan to stay here for a few days and then start looking for another weather window to cross the Gulf Stream back into U.S. waters for our summer stay in Vero Beach. The winds are expected gain strength and blow from the east to northeast for the next few days so I think we may be trapped here for awhile. Darn. Heading out for our first oceangoing voyage! Hank and Lisa aboard Haanli. 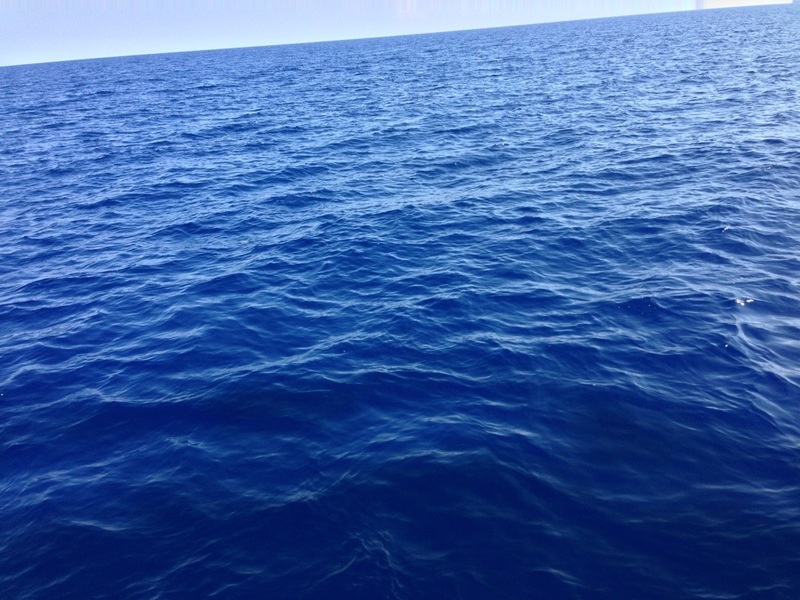 The color of the ocean in the Gulf Stream is amazing. Photos don’t do it justice. A gorgeous sunrise. Just a few more miles to go. Yeah, I’m excited about this trip! 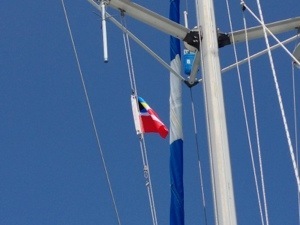 Our Bahamian courtesy flag. We are all checked in! 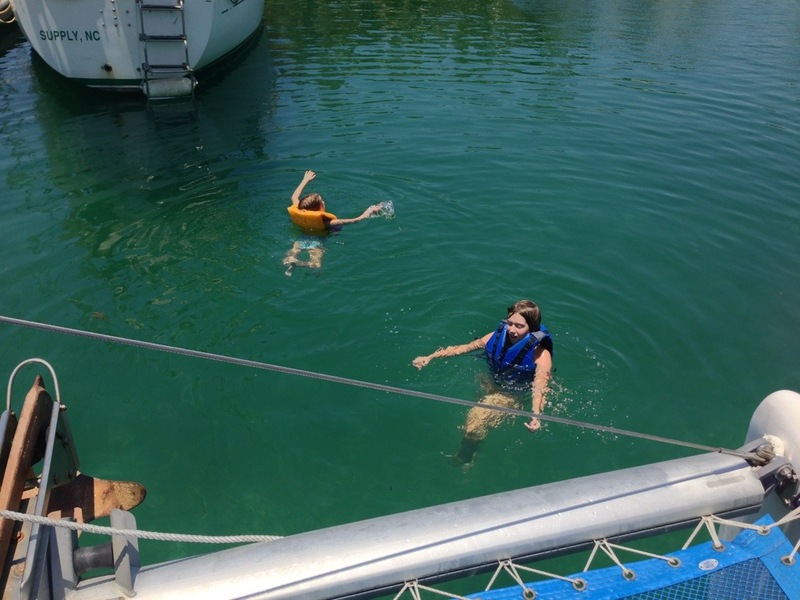 Madi enjoying the crystal clear water between our hulls. I’ll be right here if you need me. 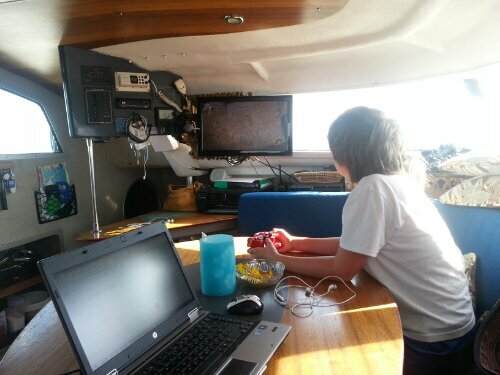 Due to small craft advisories and a poor weather window on the Atlantic, we decided to keep truckin’ down the ICW rather than hole up for another week. 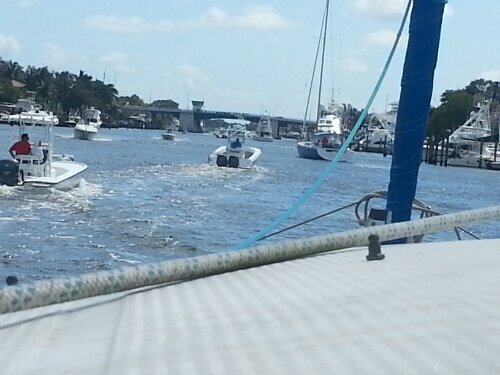 But this stretch of the ICW from Stuart to Palm Beach is making us regret our choice. 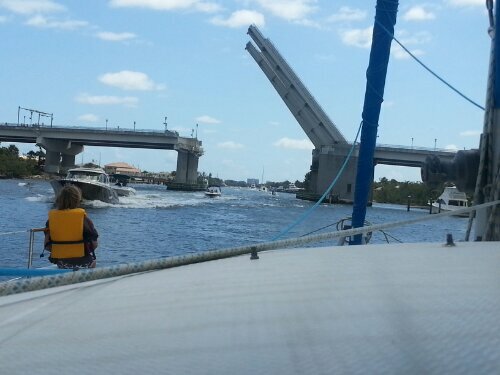 Wow…between the bridges every mile and the myriad of crazy power boaters…a week of waiting is starting to sound nice. After a lovely week visiting friends, watching a rocket launch, and exploring the insanely expensive (but cool) world of Universal Studios, we cast off our lines for points south. 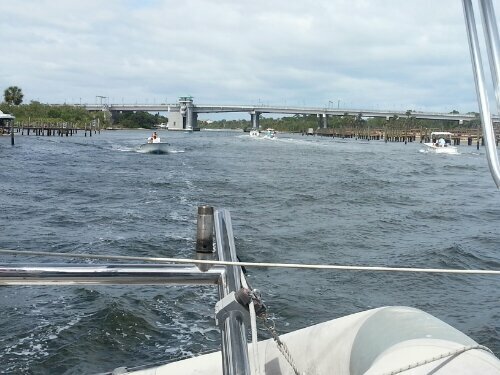 We left Titusville on Thursday morning and motor sailed down to Melbourne where we stayed the night at a marina. We also got to have dinner and final goodbyes to our friends Mark and Jodi who live just a few miles away from the marina we found. 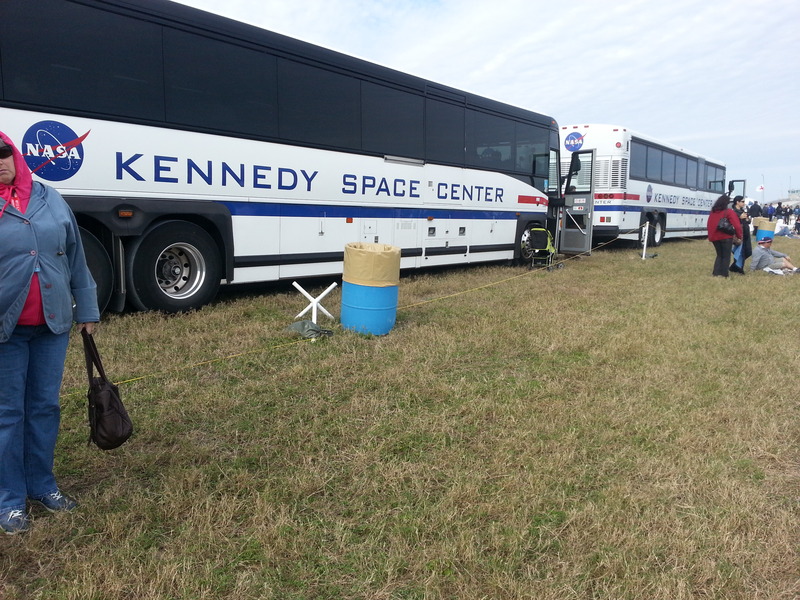 It was so nice to see them before we departed the area. 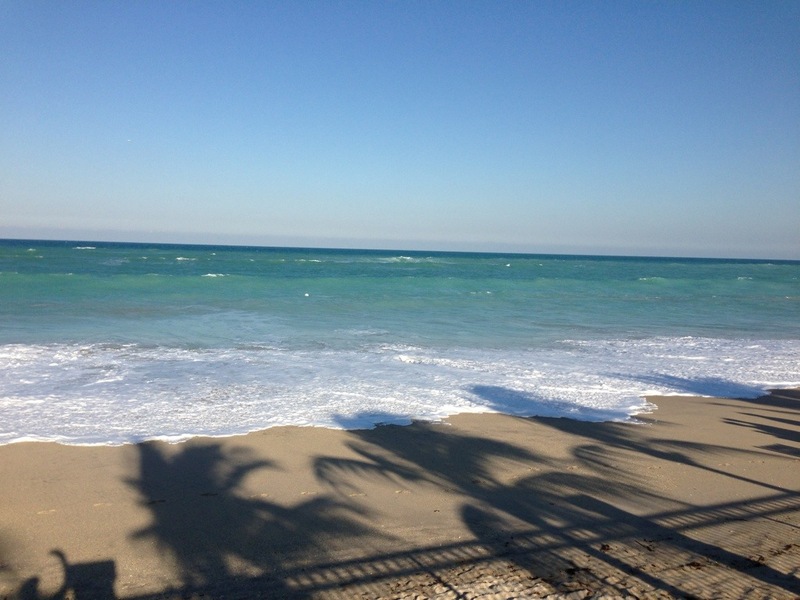 Yesterday, Friday, we headed south once again and made it here to Vero Beach. Vero Beach is a beautiful town filled with lots of shops, restaurants, and many million(s) dollar homes. I did a quick Wikipedia search and discovered that Vero Beach is of the top 6 wealthiest cities in Florida and it’s in the top 100 in the US. It shows. Our journey down here was kind of a treat as the winds were favorable for sailing! 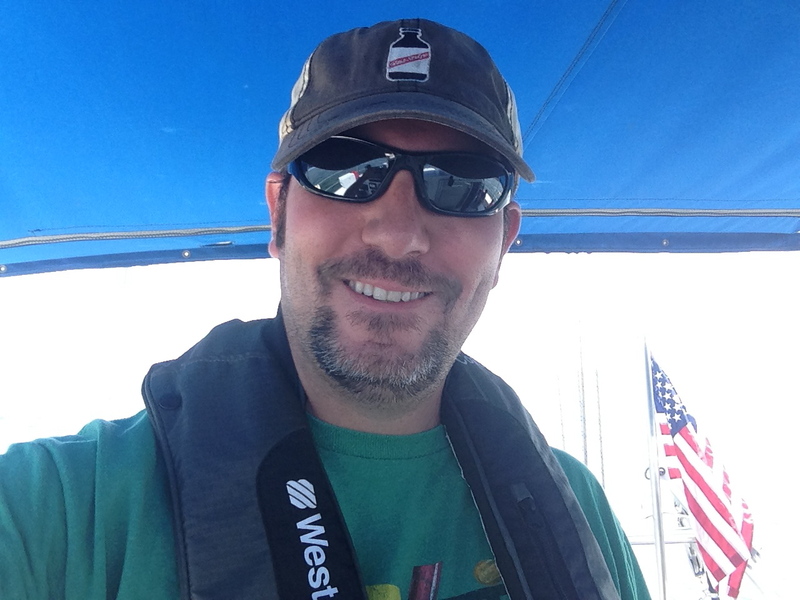 Sailing on the ICW is usually not very practical because of the narrow channels and shoaling hazards. The particular stretch of the Indian River between Melbourne and Vero Beach is very straight and the winds were blowing in just the right direction and just the right speed to knock about an hour off of our trip. Nice. 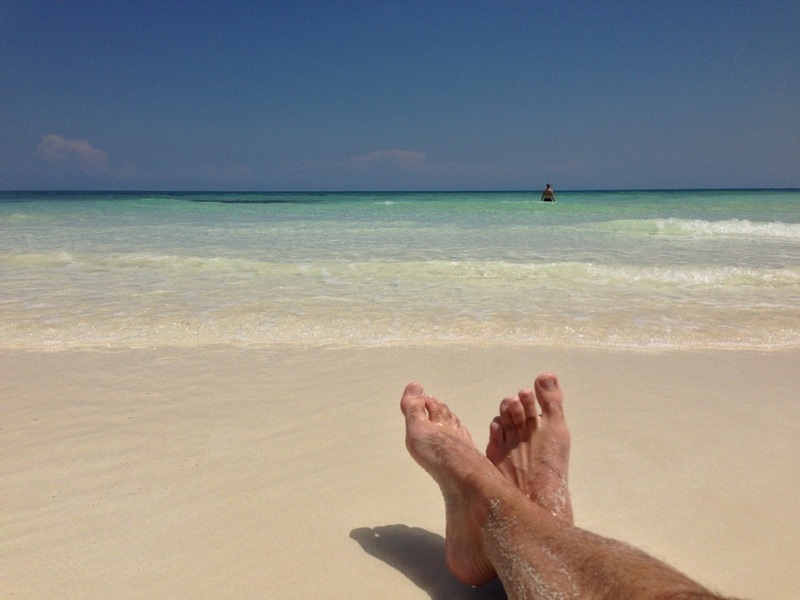 As I write this from the comfort of bed I am thinking about how close we are to taking a couple of months off on a mooring ball in Coconut Grove, Florida. If all goes well we should be in the Miami/Coconut Grove area by Monday afternoon. It’s been a wonderful journey up to this point but I am tired of motoring down the waterway. 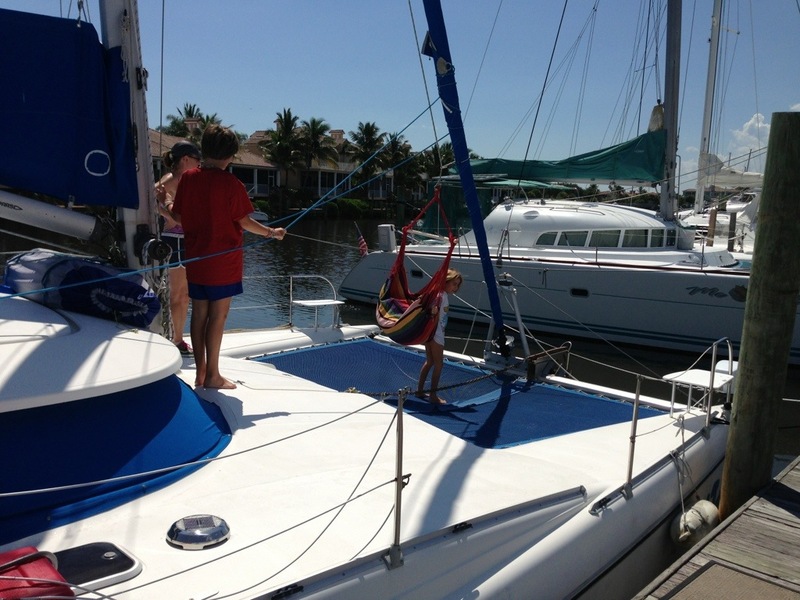 It’s time for a break and some time to prep the boat for offshore passages. We’ve come a long way but we are just getting started! What do you do underway? Madi and Peyton recently got a new video game for our playstation, Lego Lord of the Rings, and they love to play it every morning during breakfast. Thanks to the power of the sun and our beautiful solar panels (550 watts total), they don’t have to sacrifice this activity while we are underway. It’s a brave new world for our future sailors! 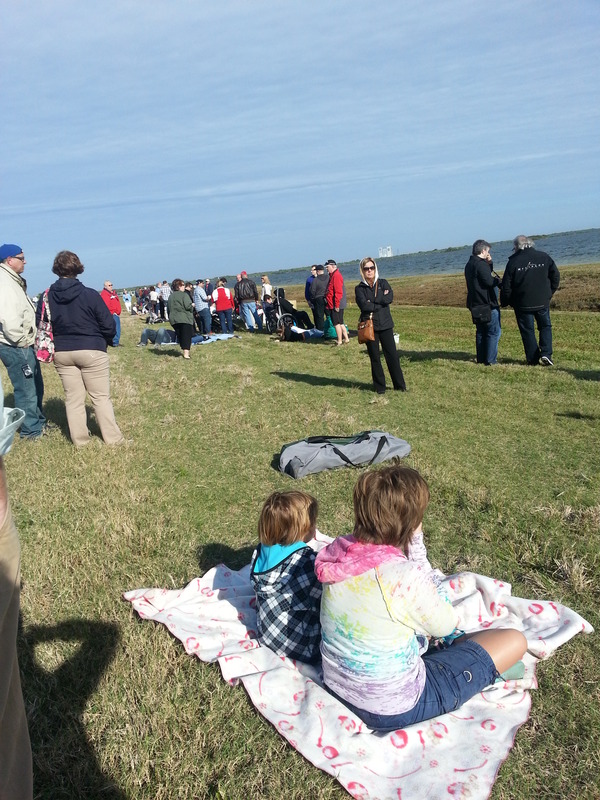 In Titusville, thanks to our friend Mark, we got to see the launch of a Falcon 9 rocket as part of the SpaceX Dragon program to resupply the ISS under a Commercial Resupply Services (CRS) contract with NASA. 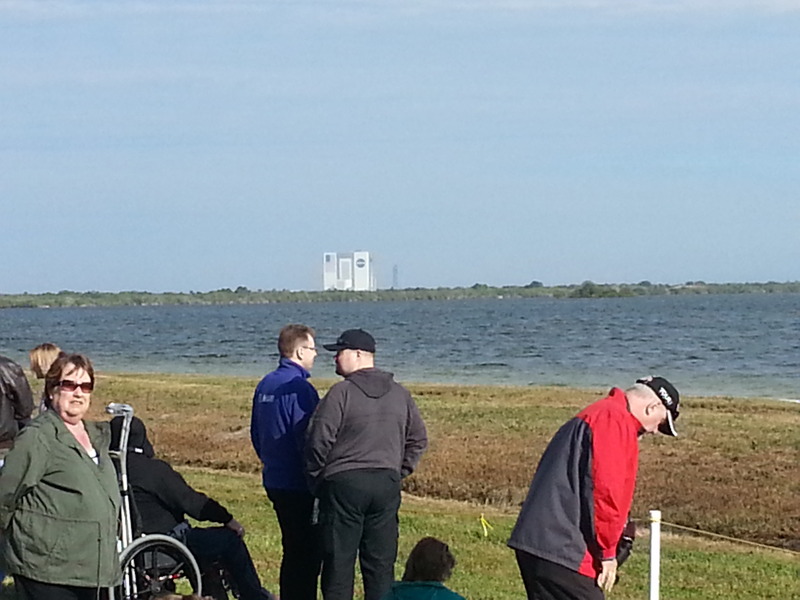 We are told this wasn’t as ear splitting as a shuttle launch, but it was truly awesome! Girls are ready for action! 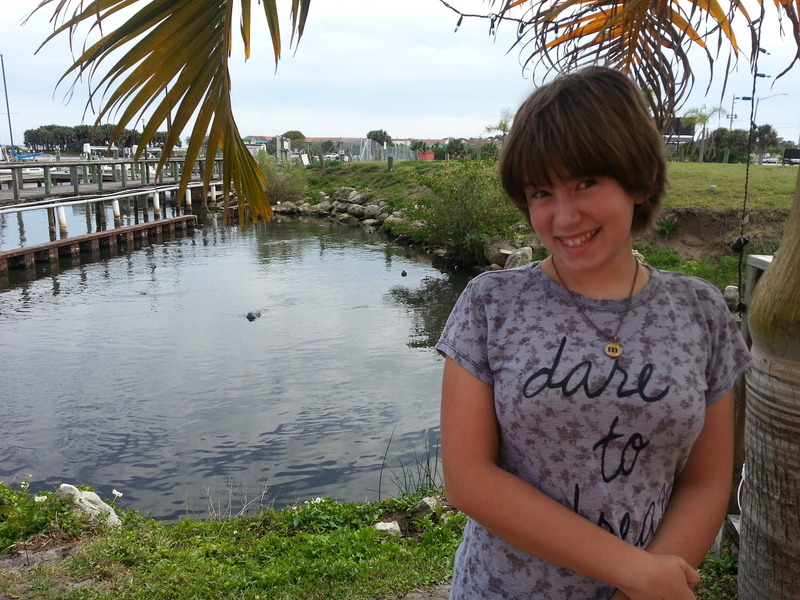 Leaving Daytona Beach, we headed down to Titusville. 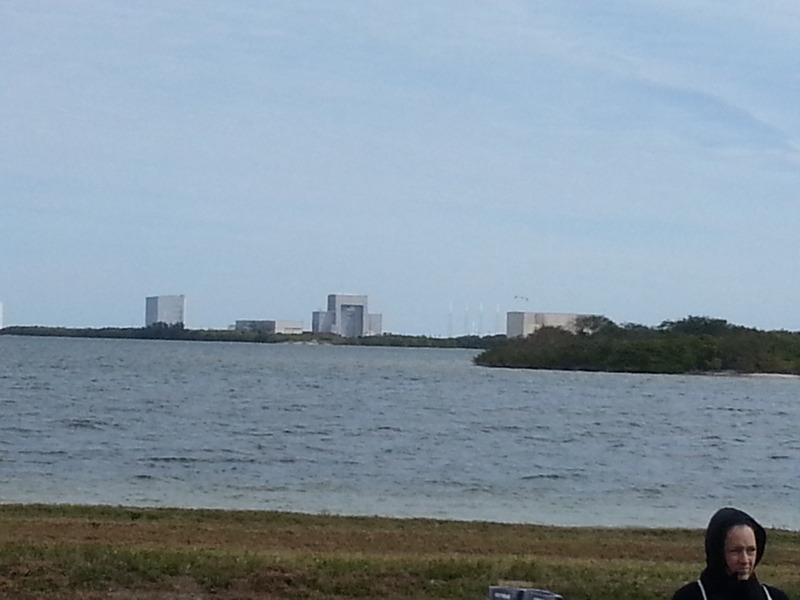 What an amazing and beautiful stretch of water, cruising through the Canaveral National Seashore. 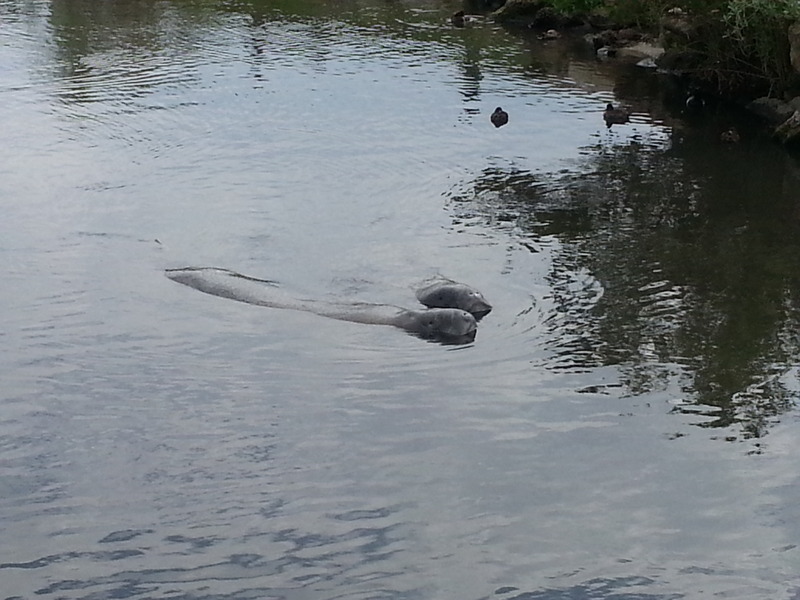 On the way we finally found wild manatees. They are everywhere, and we even had to swerve to avoid a few in our path as we meandered along. 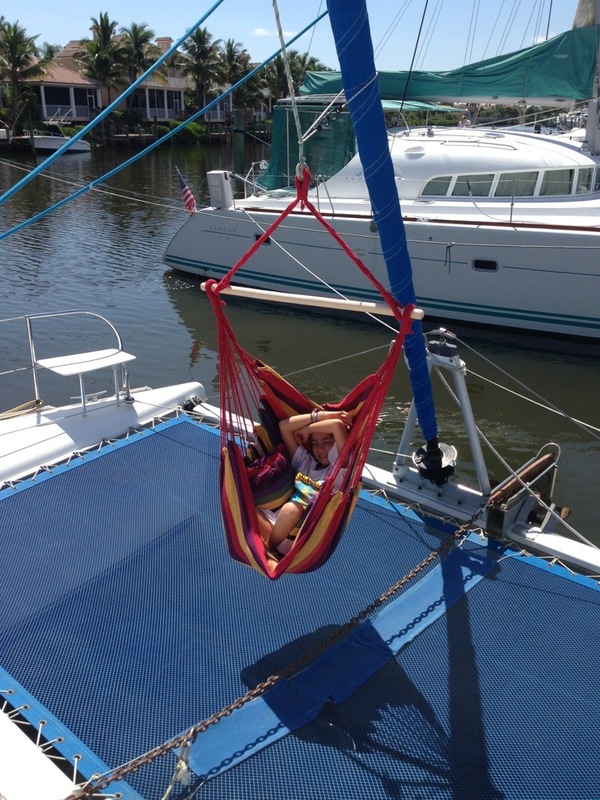 Coming in to dock in Titusville, our marina has a shallow basin where the manatee love to hang out and sun.